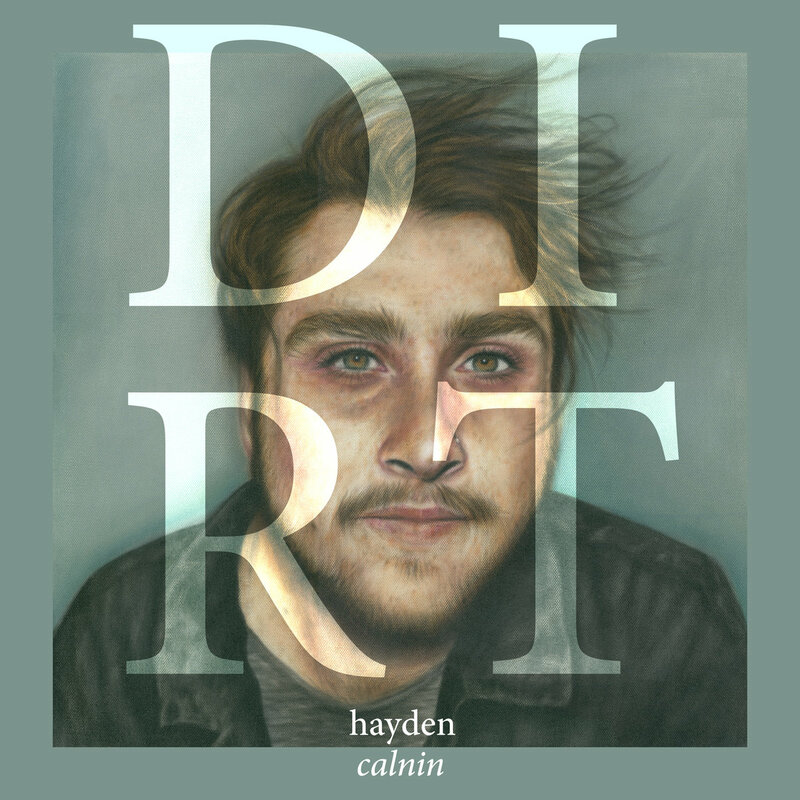 Melbourne-based Hayden Calnin released his third EP titled Dirt this past week; it’s a luminescent follow up to his two-part debut album Cut Love Pt. 1 and Cut Love Pt. 2. Dirt will keep you warm on a dismal rainy night and chill your bones on the hottest summer afternoon. Calnin digs into the core of human emotion to produce a project that mourns, hopes, and howls with splendor. “Collision,” the second single Calnin released in preparation for Dirt EP, enters the stage as a powerful anthem that reverberates with emotions edging in and out of grief, blame, confusion, and heavy loss. Tsunami-like synths vibrate in the beginning until Calnin’s voice rises like a church choir sucking us into the evocative tale of a friend’s defeat. Calnin asks his friend the thoughts that were running through his head before the final collision. Or turn away in your own thought? Were you hoping for a hero? Did you feel you’d go right through? Did you think that we’d miss you? Did you yell or were you silent? Or were you just too far down? When we are forced to confront death, especially unexpected tragedies, people naturally turn to blame themselves and asking how it could have been prevented. Calnin wrestles throughout the refrains to find the answer to the unanswerable. We watch as he walks step by step down the path the ‘you’ must’ve taken in the final moments and poetically allows beauty and learning blossom from the despair. It’s a new way to discuss mental health, alcoholism, and offering the absent helping hand to the ones closest to us. The song ends after an inconclusive three and a half minutes, which seems to parallel the abrupt exit of a death that came too soon. “Collision” leaves us unsettled and aching for more; fortunately “Waves” follows quickly and explores more of the indeterminate realm of grief. Even in its elegance, “Collision” feels tinged with whispers betrayal and anger through both the confrontational lyrics and the heavy drum hits. When “Waves” greets us with bouncing piano keys, you can tell this will be the same conversation with a different ending. Layers of Calnin’s voice travel to past regrets and mistakes while reminding us that the only space humans have the ability to affect is the present. He laments not being there for a friend, and the longing to be better can be heard in every haunting chord of his voice. The blame and confusion shift from the other party and swivels around and around until the target lands on Calnin – it’s a combative consultation with himself about individual action. Is that all in the plan? The song structures of “Visible” and “Slow Decay” are the most striking aspects of these additions to Dirt. In “Visible,” Calnin’s voice commands in the forefront as the melody plays hazily in the background like a record spinning on an old turntable. He repeats the same line over and over as if he will find clarity this way. We never reach a chorus, bridge, or even clear verse as if the song was constructed organically with a blueprint only the master designer can decipher. “Slow Decay” unfolds in similar manner, but with auto-tuned vibrating vocals to receive us and almost an absence of melody throughout the journey. It’s a confronting reflection on the temporality of life, which erupts with an alluring cacophony similar to birth and ends with wise murmurs resemblant of death. “Life Simple I & II” returns with piano keys and the late-night ambience of Hayden Calnin we know so well. He loses most of the electronic elements that have highlighted Dirt so far, and pieces together a Matt Corby-esque wailing folk song. The initial verse singes the skin with truth of the everyday actor playing the role of a happy person. The ending circles around two core thoughts inciting feelings of life and love, the maker and the partner; the questions and statements overlap and intertwine in a way to say one cannot exist without the other. Is that the unsettling simplicity of life? The drums, piano, and wavy guitar strums rise and fall with the emotion of the words until one of the lengthiest tracks of Dirt still ends too quickly. Finally, we arrive at the title track for the record, “Dirt,” a grand sendoff to help us enter reality once again. We wind our way through healing, friendship, and hurt, and attempt to use the echoing piano as a base point. The ballad wraps us up in a surreal space as Calnin introspectively croons at himself and as listeners we are forced to ask ourselves the same questions. In Atwood Magazine‘s interview with Hayden Calnin, he says, “I’m writing stories and wanting to take you on a journey. If you come to a show, I want it to be moving, not get you moving.” With the arrival of Dirt, Calnin achieves this goal with sincerity, poetry, and (as always) surprises.